We’ve heard tons of great feedback from librarians who’ve checked out LibGuides v2 – and as always, thanks so much for getting in touch and letting us know what you think! One feature in particular generated more kudos and “Oh wow, that’s awesome!”s than the rest – we’ve heard your overwhelming enthusiasm for the new LibGuides A-Z Database Management tool loud and clear! Your enthusiasm was, frankly, contagious. It inspired us to improve the A-Z Database Management tool even further, and we can’t wait to show you what we’ve cooked up! We’ve redesigned the A-Z Databases page and added two major classification facets – Databases by Type (full-text, abstracts, e-books, etc.) and Databases by Vendor. These features are available to everyone on the LibGuides v2 platform. Holy cannoli, that’s right – we’ve heard a lot of love out there for the new subject based classifications for databases & electronic resources, so we thought, why not take it a step further and offer even more finely grained classifications and filters? A scan of existing A-Z database guides confirmed that many folks already use classifications for “Type” of database/resource and “Vendor/Provider” of the database. These classification options are now a standard part of the “Databases” asset type in LibGuides v2 – huzzah! Best of all, these filters work together. Let’s say a patron needs full text sociology articles – just select Subject: sociology and Database Type: Full Text, and bang – a targeted list of resources appears! Select Manage Database Types -> Add Database Type. Add your desired types: Abstracts | Articles | Citations | E-Books | Full Text | Images | Newspapers | etc. Add your desired vendors: EBSCO | Factiva | Gale | ISI | JSTOR | Ovid | ProQuest | etc. And here’s the best part: all of the new Database filter options, including Subject, Database Type, and Database Vendor, will also be supported in the new widget and API tools. In other words, not only can your users filter your overall A-Z list by these categories, but you’ll also be able to build targeted, automatically updating lists of resources based on these parameters, and embed those lists of links anywhere. 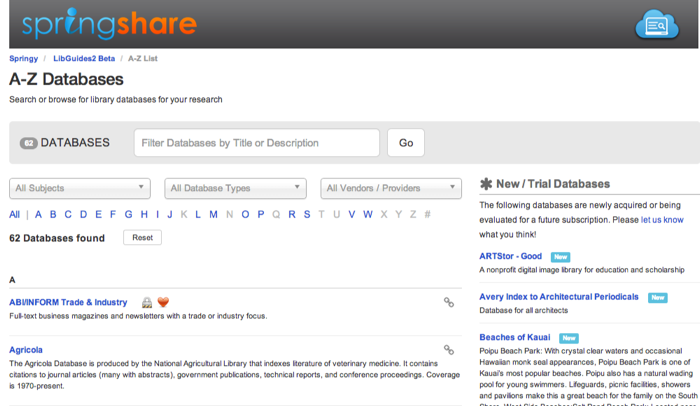 Together with the rest of the new A-Z functionality, including the ability to highlight Best Bets for each subject, and the ability to assign permalinks/friendly URL to databases, the A-Z functionality in LibGuides gives you everything you need to effectively manage your A-Z databases list. We’re confident your patrons will love the new A-Z page as well! Am I limited to including only paid resources in this list? Currently our definition of database is broad and government resources as well as professional association pages are in our A-Z list. Cleaning up the list to prepare for migration is a great exercise – I’m wondering if it’s necessary to remove the non-paid databases from this list. Thanks. Hi Accacia – apologies for the delayed reply! Don’t worry about limiting your list to just paid resources – your A-Z list can contain whatever links you want. 🙂 I’m glad to hear that cleaning up the list has been a good exercise! I assume we’ll still be able use HTML within the database descriptions to hyperlink to other pages? For instance, within our description to Academic Search Premier, we hyperlink to a tutorial on how to search it. Yes, you’re right – you’ll still be able to use HTML in the database descriptions to link to other pages. Is there/Will there be a link to Summon/360 Core resources in LibGuides 2.0 as there was in v1.0? Apologies if it is there and I just can’t find it. Thanks! Apologies for the delayed reply Jason! What do you mean when you say link to Summon / 360 Core resources? Can you point me to / describe what you mean in v1? There will be an import option eventually. We’re also going to be working on the Summon Discipline integration. We’ll be working on both of these this summer. Does that help answer your question, or was it something different you were looking for? Under Admin Stuff -> Link Management, there is an option for the A-Z list to import from Serial Solutions. I can’t find a similar option in v2 of LibGuides. I realized that I meant to type “Serial Solutions” rather than “Summon” in my question above. That is something we’re planning on adding to the system, but (as you noticed), isn’t currently there. The best thing folks can currently do in terms of database import into LGv2 is use the tools in the migration admin area of their v1 site to choose which links should be imported into their v2 site as Database Assets. More on that can be found in our guide on updating to v2 – log into your v2 site, click Help, then choose the “Updating to LibGuides v2 (including Migration)” guide. In the new LibGuides v2 can you explain how you update the database list once its in LibGudies v2? Do you re-import everything and then libgudes will keep the dupes and get rid of the broken links for you? Apologies for the delay in our response! If you’re asking about the Serials Solutions import, that works just as it did in v1 with regard to re-running the import: any changes / new databases in the list will be flagged (checked off) and those databases will be updated (or imported, in the case of new items). Anything that hasn’t changed will be ignored. You can choose to uncheck items before processing the updates, if you do not wish to update those databases at that time. Nothing is ever deleted – so if you marked a database as cancelled in Serials Solutions, the import will not remove that database from your list. You must make any deletions manually within LibGuides. If you’re asking about the Excel import, if you run a subsequent import, it will only import new items and will ignore all previously added databases – it will not update or delete any of them. So once you import your databases via the Excel import, you must update databases manually. If you were asking something completely different from this, please email us at support@springshare.com with as many details as possible about what you’re looking to do / what you’re curious about, and we’ll get you an answer as quickly as we can!